Performers include: William Fichtner, Donald Sutherland, Marc Lavoine, Gabriella Pession, Moon Dailly, Richard Flood, and Tom Wlaschiha. An action crime drama, this series taps into a unit mandated by the International Criminal Court (ICC) to investigate cross-border crimes, ultimately bringing global criminals to justice. Set in the world’s most exotic locales, an elite team of eager cops work to solve notorious international crimes. Through globalization, many countries have been opened and barriers removed to ensure easy trade, travel and cultural diversity. However, this openness has given opportunities to criminals looking to exploit the system and ultimately threaten our global safety. As Europe has become a “safe house” for criminals eluding law enforcers, a special kind of law enforcement team is needed to handle specific ongoing crimes on a global level. This show follows one such team, made up of five international cops, headed by Captain Louis Daniel (Marc Lavoine). The team — comprised of individuals who have little in common – must learn to live and work under the most dangerous and potentially deadly conditions. Housed in an unused storage section underneath the ICC, this mismatched team faces bureaucratic, jurisdictional and cultural obstacles while traversing continents in pursuit of justice. Carl Hickman (William Fichtner) is a wounded New York cop who was pulled from the edge by a group of unlikely saviors. Michel Dorn (Donald Sutherland) is an inspector in the International Criminal Court. Others on the team are Europol sergeant Eva Vittoria (Gabriella Pession), French detective and criminal analyst Anne-Marie San (Moon Dailly), Irish detective Tommy McConnel (Richard Flood) and Berlin police officer Sebastian Berger (Tom Wlaschiha). What do you think? 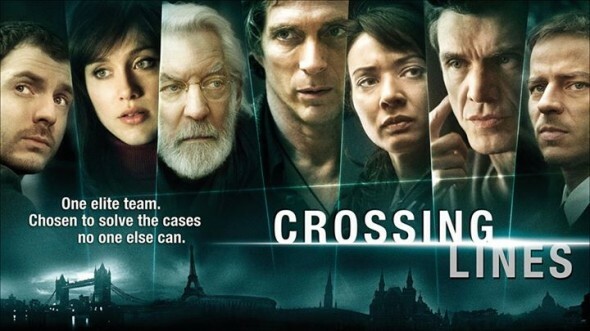 Do you like the Crossing Lines TV series? Do you think it should be cancelled or renewed for another season? Loved this program until season three. New cast and cases not interesting anymore. Season 2 left everything unfinished and season three is almost like a different show. Very disappointed in the way it changed. Have watched a couple of episodes in season 3 to see if it still keeps me tuned in but does not interest me anymore. No reflection on new cast, they are great actors but changes are extremely disappointing. Don’t think I will continue watching. Wish I had discovered this quality gem earlier, & now I find out its in jeopardy?! How absolutely disappointing! The show is captivating, the writing is excellent, the acting is more than credible & of high caliber, the setting/locations intriguing with its global backgrounds, creatively its out of the box & not formulaic nor very predictable. Yes there are loose ends, but… use your imagination! Enough with mediocrity. I wonder if it had more “promotion” it would have had higher viewing numbers?